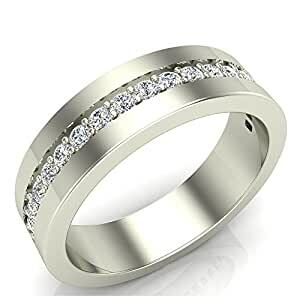 Semi-eternity Menâs Diamond Wedding Band is a classic comfort fit diamond wedding ring that is a simple yet glittering statement piece when you exchange wedding vows. Can also make a great upgrade diamond wedding band during an Anniversary occasion. The single line of diamonds stretch from one side to the other creating an aura of sparkle and gold which gives this piece the right amount rich but elegant look.